Listed below are details of all the UK basic personal bank accounts available to those who just require a simple no-frills bank account to manage their funds or those with adverse credit who find it difficult to open any standard UK personal bank account. We have also included ‘managed’ guaranteed personal bank accounts for those who have exhausted all other avenues. Currently there are at least 21 mainstream UK basic personal bank accounts and at least 4 UK ‘basic’ business bank accounts including all the managed accounts. Basic bank accounts listed below all active and all external links working as of 18th March 2019. The eccount money account is a UK personal managed current bank account which comes with a linked prepaid Visa debit card. Funds can be transferred to and from the card from the main account. The account is available to anyone who is a UK resident and at least 18 years old (subject to identity and address checks). Individuals who have a bad credit history including undischarged bankrupts and those in an IVA can open an account. A guaranteed personal current account for those resident in the UK (subject to identity and address checks). No credit checks. Undischarged bankrupts or those with an IVA (Individual Voluntary Arrangement) can apply. Visa prepaid debit card. Withdraw up to £500 in cash per day. Standing orders (once account has been upgraded). Pay in salary/wages/benefits once account has been upgraded. Pay in cash at Post Offices (free) and at over 28,000 PayPoint locations nationwide (3% transaction fee). Online banking, mobile banking and automated telephone banking service. Monthly fee of £12.50. Opening fee of £12.50. CardOne Banking offer a managed (rather than basic) UK personal current account complete with prepaid Mastercard debit card. Funds are held with Barclays. With this managed (rather than basic) account, funds are paid in and out of a billing account and can be transferred to and from a Mastercard debit card that comes with the account. The account is available to anyone who is a UK resident over 18 (subject to identity and residency checks). Individuals with an adverse credit history and even undischarged bankrupts and those in an IVA can open an account. There is a monthly management fee of £12.50 (£17.50 for 2 names on the account). A guaranteed (subject to conditions) managed personal current account for those resident in the UK (subject to identity checks). No credit checks. Undischarged bankrupts or those with an IVA (Individual Voluntary Arrangement) will be accepted. Identification and address checks will be carried out. Pay in salary/wages using BACS. Pay in cash and cheques at Barclays. Pay in cash at Post Offices but not cheques. Withdraw up to £450 in cash per day using the prepaid Mastercard debit card. Online banking, automated telephone account access and mobile account access using SMS text messaging. Text alerts for bill payments, payments in. Cannot use prepaid Mastercard at LINK ATMs. Monthly management fee of £12.50 (£17.50 for 2 names on the account). 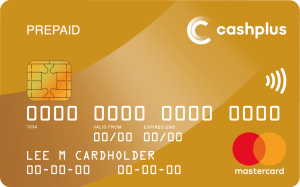 The Cashplus prepaid Gold MasterCard is one of the UK’s leading prepaid debit cards and can also be used as an alternative to a basic personal UK bank account as it does offer facilities such as Direct Debits and Standing Orders. The card is available to anyone (including undischarged bankrupts and those in an IVA) provided they are UK residents over 18 and subject to identity and address checks. There are charges and fees for using this prepaid Mastercard bank account. A guaranteed acceptance basic personal prepaid bank account for those resident in the UK (subject to ID checks). No credit checks. Applicants who are undischarged from bankruptcy or are in an IVA can open an account. Pay in cash at Post Offices for free. Pay in cash at over 1600 Cashplus stores throughout the UK for free. Online and telephone banking plus an SMS text and alerts service. The Royal Bank of Scotland Basic Foundation Bank Account is their new rebranded basic personal current account. You can no longer apply for this account directly and must first apply for one of their standard personal current accounts. They state that if you are refused for the standard account for any reason then you may be offered the new Foundation Account. There are no fees provided the account is run responsibly and the account comes with all the usual facilities one would expect form a current account including a Visa debit card but no overdraft facilities. Full access at UK Post Offices. Inward electronic payments (e.g. BACS). 24 hour telephone account access. Emergency cash service from ATMs. No fees provided account is run responsibly. Natwest Bank is part of the Royal Bank of Scotland Group plc and the Basic Foundation Bank Account is their new rebranded basic personal current account which is pretty much identical to the Royal Bank of Scotland account above. There are, however, far more NatWest branches in the UK than RBOS branches. You can no longer apply for this account directly and must first apply for one of their standard personal current accounts. Ulster Bank is part of the Royal Bank of Scotland Group plc like NatWest and operates exclusively in Northern Ireland. The Foundation Basic Current Account is their new rebranded basic personal current account and is pretty much identical to the Royal Bank of Scotland and NatWest basic accounts above. Lloyds Bank (part of Lloyds Banking Group) offers a basic personal UK bank account that provides a Visa debit card and most of the facilities available in their Classic current account. It is only available if you’ve already applied unsuccessfully for one their other current accounts. It is for individuals who are 18 and over and proof of ID and address is required. A basic personal account for those resident in the UK or from EU countries outside the UK. Over 1000 branches in the UK plus free account access at Post Offices. Deposit cash and cheques over the counter at any Lloyds Bank branch or UK Post Office free of charge. Withdraw up to £500 per day cash (subject to funds) from Lloyds Bank Cashpoint machines and £300 per day from Post Office branches free of charge. Monthly online and optional paper statements. The account has no charges when run properly. No CIFAS fraud flags allowed. Bank of Scotland (which is part of the Lloyds Banking Group) offers a basic UK personal current account. It may only be available if you don’t meet the conditions for one of their other current accounts which you have to apply for initially. The account provides a full Visa debit card and is aimed at those who are over 18 and who are either a UK resident or EU national. A personal current account for UK residents or EU nationals. Branches in most parts of the UK. Ideal for those who want a no frills account or who may be finding it hard to get an account because of an adverse credit history. Full deposit/withdrawal service at UK Post Offices. Internet banking and telephone banking. Buffer zone of £10 (can go overdrawn up to this amount without any unarranged overdraft charges being levied). No overdrafts are available and there is no cheque book. Cannot withdraw cash over the counter at a branch. Halifax (which is also division of the Lloyds Banking Group) offers a basic UK personal current account. It is aimed at over 16s who want a no frills account or for those who might find it difficult getting an account elsewhere because of their previous bad credit history. Just like the Lloyds Bank and Bank of Scotland basic accounts above, it may only be available if you don’t meet the conditions for one of their other current accounts. Discharged bankrupts can apply provided they can provide a letter of discharge. Internet, mobile and telephone banking. Pay in salary or benefits. Withdraw up to £300 in cash per day at ATMs. Withdraw up to £2500 cash in a branch. Withdraw up to £300 at Post Offices which offer full account access. £10 buffer zone. This means it is possible to go overdrawn by up to £10 without attracting any overdraft charges. No monthly fees or charges. No one with an IVA (individual voluntary arrangement) can open an account. Yorkshire Bank offers a basic UK personal current account called Readycash. Yorkshire Bank is a trading name of Clydesdale Bank plc. Consequently you can operate this account at both Yorkshire Bank and Clydesdale Bank branches. It is aimed at over 16s who are UK residents and who for some reason can only obtain or might just want a basic account. It now comes with a Mastercard debit card. A basic personal current account for those resident in the UK. Branches in many parts of England. Clydesdale Bank branches can also be used. Withdraw up to £350 per day in cash from Yorkshire or Clydesdale Bank branches, ATMs or the Post Office. Deposit cash and cheques at any Yorkshire or Clydesdale Bank branch or Post Office. Obtain balance enquiries at any Yorkshire or Clydesdale Bank branch or Post Office. Standing Orders and Direct Debits. Pay in benefits or salary. The account is free to operate when run properly. No cheque book is available. Clydesdale Bank is one of Scotland’s largest banks which also trades as Yorkshire Bank (see above basic account). Consequently they also offer a Readycash account which is pretty much identical to the Yorkshire Bank Readycash account. Clydesdale Bank branches are situated mainly in Scotland and the the North of England. You can also use branches of Yorkshire Bank. The account is aimed at UK residents over 16 who might not be able to get a standard personal account because of some previous adverse credit or who might simply want a basic account for everyday transactions. A basic personal account for those resident in the UK. Branches in Scotland and North of England. Yorkshire Bank branches can also be used. Withdraw up to £350 per day in cash from Clydesdale or Yorkshire Bank branches, ATMs or the Post Office. Deposit cheques and cash at any Clydesdale or Yorkshire Bank branch or Post Office. Obtain balance enquiries at any Clydesdale or Yorkshire Bank branch or Post Office. Pay in wages or benefits. The account is free to operate when run responsibly. No overdraft or cheque book is available. No CIFAS fraud flags are permitted. No one undischarged from bankruptcy. Barclays offer a basic personal UK current bank account for those with or without a bad credit history including those who are undischarged bankrupts. The account comes with either a Barclays Visa debit card or an ATM card. Applicants must be at least 18 years old and be resident in the UK. Barclays state that their Basic Current Account is only available to certain people in certain circumstances (i.e. not eligible for the standard account for some reason) so you have to apply for their standard account initially to see where you stand. More than 1600 branches nationwide. Visa debit card or ATM cash card depending on circumstances. Manage the account at any Barclays branch. Full access to account at UK Post Offices. Internet, telephone and mobile banking with text alerts. Fee free cash withdrawals of up to £300 per day from Barclays and LINK branded ATMs. Undischarged bankrupts accepted. This basic account is one of only a few personal current accounts from high street banks that accepts undischarged bankrupts. The account has no charges when run responsibly. No overdraft facility and no cheque book. No CIFAS fraud flags are allowed. The Co-operative Bank offers a basic personal UK bank account which comes with a Visa debit card as standard. It is aimed at those who may have previous bad credit and who may not be eligible for their other accounts. The account used to be available to undischarged bankrupts, but unfortunately no longer is. Applicants must be at least 16 and a UK resident. Suitable for those with bad credit including IVAs. Minimum opening and operating balance of just £1. Internet, telephone and branch banking. Deposit cash/cheques and obtain balance enquiries over the counter at any branch. Deposit cash/cheques, withdraw cash and obtain balance enquiries at Post Offices free of charge. Withdraw cash from any branch and from most ATMs displaying the LINK symbol free of charge. Withdrawals from VISA/PLUS ONLY ATMs will incur a fee. The account has no charges (or monthly subscription fees) when run properly. No undischarged bankrupts although up until recently they were the only high street banking institution other than Barclays to accept those undischarged from bankruptcy. Nationwide offer a basic UK personal current account for over 18s that comes with a Visa debit card. It is aimed at those who may not be able to get a fully featured current account elsewhere because of their previous bad credit. UK’s largest Building Society with branches in most parts of the UK. Ability to withdraw up to £300 per day in cash from an ATM. There are no charges when withdrawing cash from Nationwide ATMs in the UK. Withdrawals from Visa/PLUS ATMs in the UK may incur a charge. Withdraw up to £500 cash a day from a Nationwide branch. Minimum withdrawal £100. Free cash withdrawals of up to £300 at Post Offices where it is also possible to obtain a balance enquiry (no deposits allowed at Post Offices). No overdrafts facilities or cheque book. No cash withdrawals outside the UK. No requests for mini statements or balance enquiries can be made at a branch counter. An ATM, their Internet Bank or telephone service must be used instead. HSBC offers a basic personal bank account with Visa Debit card to UK resident individuals. It is aimed at those who have either some bad credit history or just want a simple account for everyday transactions. HSBC state that before applying for a Basic Bank Account, they first need to see if you are eligible for one of their standard range of accounts to ensure that they open the account best suited for your needs. So, basically, you have to apply for a standard account initially. Most bad credit is acceptable. Withdraw up to £300 per day cash from any UK ATM or UK Post Office. Deposit cash and cheques at Post Offices, HSBC self-service ‘paying-in machines’ and HSBC branches. Internet banking and telephone banking services. £10 buffer zone. No charges if you go overdrawn by up to £10. The account has no charges or fees when run properly. No cheque book or overdraft. Cannot withdraw cash at branch counters. Danske Bank is a Danish owned bank operating in Northern Ireland and they offer a basic bank account which provides a Mastercard debit card. The account is available to individuals over 18 who are permanent residents of Northern Ireland, but can be operated through any UK Post Office once opened. It is aimed at those who may have adverse credit or just want a simple account to pay in wages or benefits. A basic personal account for those who are permanent residents of Northern Ireland. Online, telephone and branch banking. Deposit cash at any Danske Bank branch or UK Post Office. Deposit cheques at Danske Bank branches or Northern Ireland only Post Offices. Withdraw up to £350 cash per day at any Danske Bank branch or UK Post Office (where balance enquiries can also be obtained). No cheque book or overdraft facilities. Only available to permanent residents of Northern Ireland. Metro Bank which operates mainly around the Greater London area offers a basic Cash Account which comes with a Mastercard debit card. The account is available to individuals over 11 years old and who are residents of the UK. It offers most of the facilities of a basic current account except outward Direct Debits or Standing Orders and consequently is aimed at those who want a very easy to obtain and simple current account. An easy to obtain instant issue basic personal current account for UK residents aged 11 and over. Withdraw cash using the Mastercard cash card at any Metro Bank UK ATM free of charge or any other ATM that displays the Mastercard / LINK logo. Withdraw cash over the counter in branch. Those aged between 11 and 15 can withdraw up to a maximum of £300 per day. Those aged 16 or over can withdraw up to any amount as long as at least one banking weekday notice is given if the amount is more than £1,000. Deposit cash and cheques in branch or at any UK Post Office. Monthly paper or paperless statements. The account has no charges or monthly fees. No overdrafts and no cheque book. No outward Direct Debits, outward Standing Orders or outward electronic payments. It is not possible to use the Mastercard Debit cash card outside the UK to make payments or withdraw cash unless an ATM where the LINK network logo is displayed is being used (currently limited to Gibraltar, Channel Islands, Isle of Man and France). Also, Sterling only Internet payments. Limited branch network with stores only in the London/South East region. Limited account facilities at Post Offices. Santander UK offer a basic UK personal current account with Visa debit card. Applicants must be aged 16 or over. The account is designed for those who want a simple way to manage their money or for those who might not be able to get a normal current account because of an adverse credit history. A basic current account for UK residents. One of UK’s largest banks with over 1000 branches in the UK. Pay in cash/cheques, withdraw cash and get a balance enquiry at any UK Post Office. The account has no charges when run correctly. No cheque book or overdraft is available. A maximum of only £10K can be kept in the account. The bank may refuse accounts to those who already have another current account with a different bank in the UK and you can’t already have a current account with Santander. Bank of Ireland UK is part of the Bank of Ireland Group which is Ireland’s largest bank and offers a basic personal current account to UK residents over 16. It is only available in Northern Ireland so is suited to those residents living there. A cash card only is provided which can be used to manage the account in Northern Ireland and the UK. The account is designed as an easy way to manage your money whether you have an adverse credit history or not. A basic personal account for those resident in the UK but suitable for those living in Northern Ireland as it has to be applied for in a branch and all branches are in Northern Ireland. Cash card that can be used to withdraw funds from any Bank of Ireland, First Trust, Ulster Bank and Danske Bank cash machines in Ireland or LINK cash machines anywhere in the UK. Withdraw and deposit cash, deposit cheques and obtain a balance enquiry at any UK Post Office. Mobile, online and telephone banking. The account provides fee free banking when run properly. No cheque book or overdraft facility. Must apply by visiting a branch of Bank of Ireland UK in Northern Ireland. Many people in the UK don’t have a personal bank account. Some of those people find it difficult to open a standard current account with a full function debit card, cheque book and overdraft facility because of either a previous bad credit history (defaults, county court judgments (CCJs), IVA) or a low credit score due to them not being in full time employment, not being on the electoral register or not owning their own home, for example. To overcome this problem UK banks are obliged to offer stripped down versions of their current accounts without the overdraft, cheque book or fully functioning debit card. These accounts are called basic bank accounts. Many of them still come with debit cards (real time authorisation type) and most of the facilities that the standard current accounts provide such as online/telephone banking and Direct Debits / Standing Orders. Banks don’t really publicise these accounts as they are not a profitable service to offer. They are obliged to offer them though. Some of the UK high street banks no longer allow you to apply for their basic accounts directly and you must apply initially for their standard current account. If you do not qualify for the standard account then you may be offered their basic account. Despite the accounts being easy to obtain, the banks are still required to carry out identity and residency checks which could still be an issue for some individuals. There are even basic accounts available to undischarged bankrupts such as the Barclays Basic Bank Account, the Virgin Money Essential Current Account, possibly the Nationwide FlexBasic Basic Account as well as the managed eccount, cardone and cashplus accounts. However, anyone with a CIFAS fraud flag on their credit file is still likely to be refused by the high street banks. Branch Access information has been obtained from the Bank / Building Society / Financial Company websites directly and some other crossing referencing. Post Office Counter Access information has been obtained from the Post Office website and this Post Office document. Our comparison table should be used as a guide only and we make no guarantees about the information presented. Applicants are advised to check the details with the actual banks before making an application for a basic account. Applicant must be at least 18 years old unless otherwise stated. All accounts require ID and address verification and all high street banks will almost certainly refuse you any account should you have any CIFAS fraud flags on your credit file. Many other UK Bank / Building Society accounts are available that allow someone with an adverse credit history to carry out very basic money management. These include basic savings and other accounts. However, as they don’t really offer what one would call ‘proper’ banking facilities such as Direct Debits or Standing Orders then they haven’t been included in our comparison table above. One such account is the Post Office Card Account suitable for those in receipt of benefits/pensions/tax credits. Some debit cards such as the Visa debit card that comes with the NatWest basic account, for example, may not work at petrol pumps as these particular cards require real time authorisation. All the accounts listed offer Direct Debit and Standing Order facilities unless otherwise specified. Unless otherwise stated none of the accounts require a minimum opening balance. The ‘Buffer Zone’ amount is the amount by which you can go overdrawn without incurring any unauthorised overdraft fees. Cash withdrawals at Post Offices (where this service is available) can be carried out free of charge. Some banks will not allow you to open a basic account should you already have an account with another institution. Nationwide is one such bank. To open any of the above accounts including the guaranteed managed ones such as the Tuxedo eccount guaranteed acceptance current account or the CardOneBanking current account, applicants need to provide proof of identity and proof of address. Proofs of identity usually mean photo ID such as a passport or driving licence and proof of address could be a council tax or utility bill, for example. The relevant bank will provide a list of acceptable documents. Also see the ID Handbook for full details about providing ID. Although banks will not generally carry out a credit check with a credit reference agency when someone applies for a basic account, they may make an electronic identity check which can often be used as an acceptable alternative to providing hard copies of ID. Foreign nationals residing in the UK (students, for example) are also generally able to open basic accounts using their overseas passports/ID cards as acceptable forms of ID.